I’m sure like many people, I lay in bed at night and scroll through Facebook Marketplace searching for unique finds, diamonds-in-the-rough, pieces with potential and other such items. You guys do this too, right?! Never mind. Let me have this moment. I do this Facebook Marketplace scrolling late at night because I don’t want to be tempted to jump in my car right that second to go retrieve an item I don’t need. I also like to overthink my purchases and this tactic enables that behavior. You guys overthink your purchases too, right?!?! One night as I was scrolling I saw this chair. I thought it looked like the best chair I’d ever seen really neat and not something I see everyday. If I time warped back a few decades, I’m sure these chairs were everywhere. It was super late 9:37 p.m. and I decided to save the listing for later. 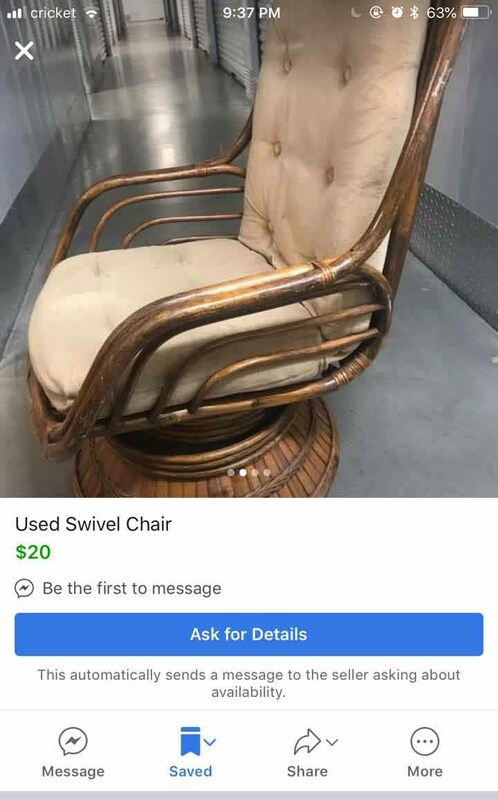 I looked at the listing again the next night and couldn’t believe no one had bought the rattan swivel chair yet. What’s wrong with all these people? On the third night the chair still had not sold. At this point, I’m understanding that no one else thinks this chair is the best thing ever neat except me. That’s when I started to question my judgment. I decided I needed some reassurance, so I asked someone who I trusted to tell me what I needed to hear at that moment. That was good enough for me and a lifetime day later the rattan swivel chair was all mine! My plan was to recover the chair cushion. I don’t have a sewing machine and my sewing skills are limited, so I got a bid to have a new cover made. On the phone the guy told me $60. After he looked at the pictures I sent he changed the quote to $220 plus fabric. Way to kill my buzz, Upholstery Guy! At this point in the story, let’s refer back to the fact that I’m not crazy. The rational part of my brain says there is no way I can spend $220 plus fabric recovering a $20 chair. At least, not without trying to make a cover myself. I should have taken the time to get a second quote, but the irrational part of my brain could hear my mother laughing maniacally from heaven. Why? Because she tried to teach me how to sew as a kid, but I never had the patience or desire to learn. I still don’t have the patience. And the desire to learn? That comes and goes with the price of upholstery services. Basically, I’m like my 8-year-old who doesn’t want to learn multiplication because addition is easier. Even though multiplication is a shortcut for addition and will make your life easier if you take the time to learn how to do it properly. I’m seeing some personality parallels between myself and my 8-year-old that make me uncomfortable. For the record, I did learn multiplication and division and calculus and some other math I’ve forgotten. All this self-reflection is for the birds! How about I just tell you what kind of predictable insanity happened next? I’d just see if I could make a cover myself without any instructions or sewing machine or any idea what I was doing. I went to Joann’s and found some fabric that was reasonably priced for this little experiment. I couldn’t spend $30-40/yard on upholstery fabric because that was too much of a gamble given that the odds were not in my favor. I could handle $7/yard on outdoor fabric though. Outdoor fabric should be tough enough for our household to use indoors. By the way, if they gave out Academy Awards for acting like you know what you’re doing while buying fabric at Joann’s then I’d be Meryl Streep. I used a seam ripper (yes, I have one of those) to take apart the old cover. I used the pieces of the old cover as my pattern for the new cover. 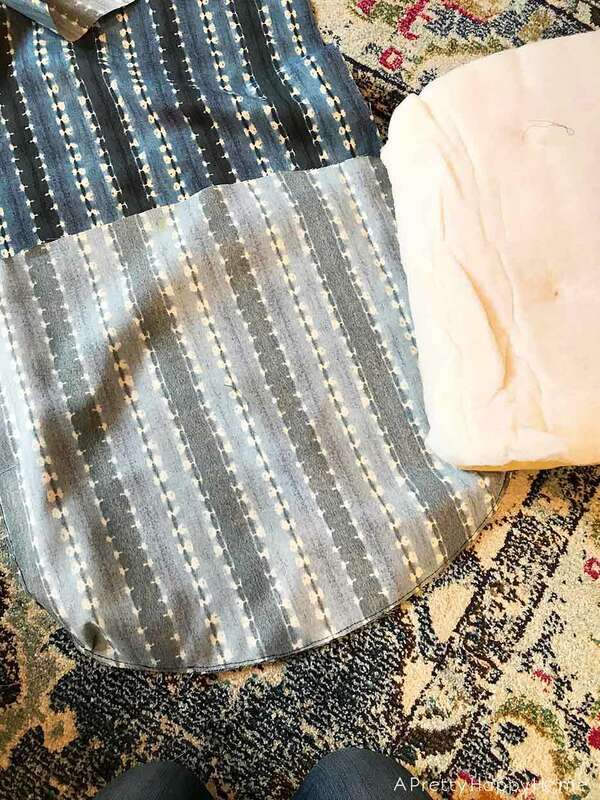 I cut my fabric out, pinned the pieces together inside out with straight pins (yes, I have those too) and then inserted my cushion just to see if it fit reasonably well. I’ll fast forward through the parts where I pinned things together incorrectly and had to start over. There was also an incident between my thumb and the seam ripper that you do not want to know about. With all my fabric pinned, I said a prayer and began hand stitching the pieces together. Yes, you read that correctly. Hand stitched with a needle and thread and Netflix. It took me an ENTIRE SCHOOL DAY to do this project. 6 solid hours hours! I’ve birthed babies faster than that. That says less about the eject button on my uterus and more about how I should have learned how to use a sewing machine. Also, I should buy a sewing machine so I can learn how to use one. It’s a good thing I didn’t try to add a zipper or tufted buttons to the cover because I’d still be stuck on the floor trying to figure those things out. I stopped while I was ahead because my cover lined up reasonably well given my lack of experience. My stitches also held up while I wrestled with the cushion to get it inside the cover. That right there was a win! The cover has also held up in the weeks since I’ve completed it, so I’m happy that the blood loss, frustration and oodles of time spent weren’t completely in vain. Also, I am still infatuated with this chair. I can’t explain why, but I like what I like. 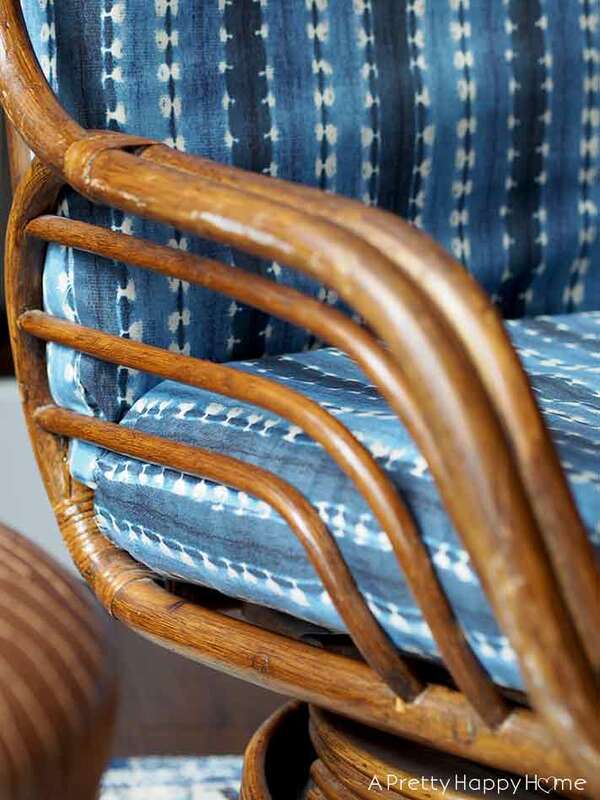 The only question left is what am I going to do when I get tired of this fabric on my rattan swivel chair and want to switch it up? P.S. 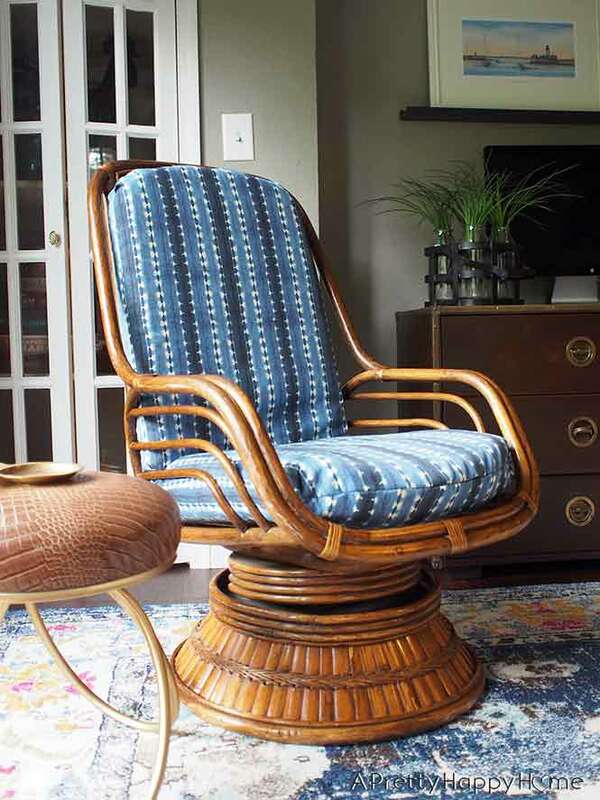 This rattan swivel chair was one of my recent thrifting finds that I mentioned I needed to tell you about in this post. 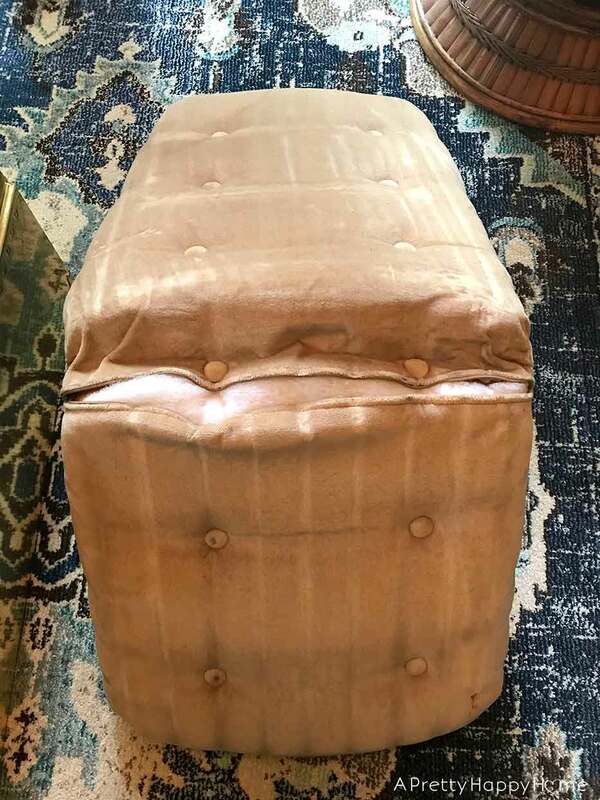 A lady was selling items from her grandma’s estate and said her grandma had this chair for a long time. 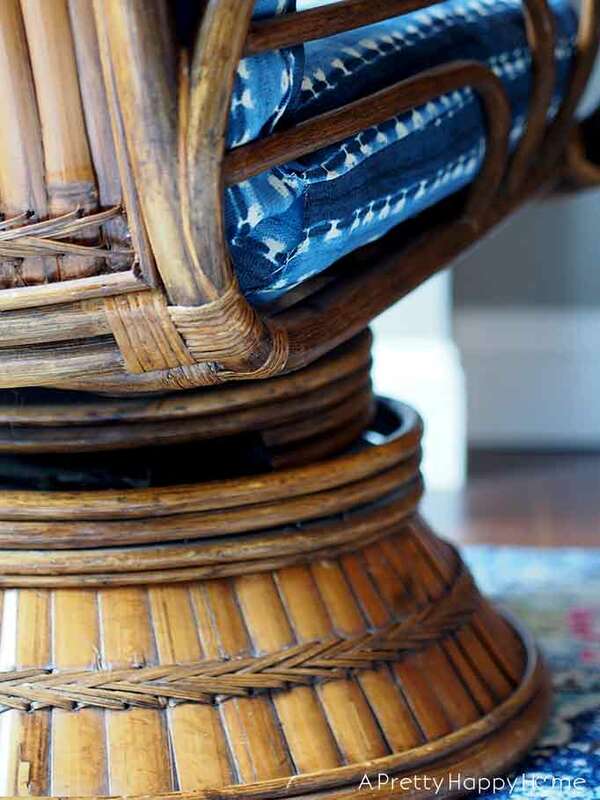 She didn’t know how her grandma came to own it, but the chair was manufactured in Arkansas. 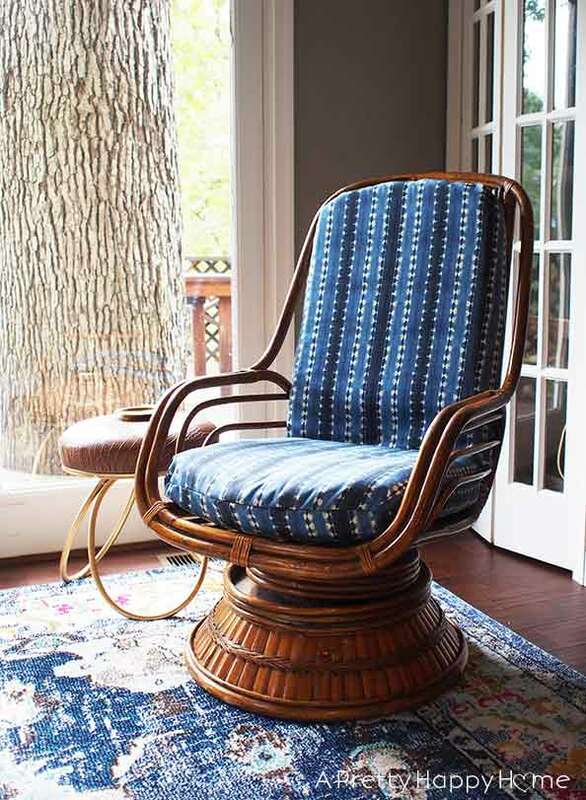 Thanks for reading about my fresh take on a rattan swivel chair. You are amazing! Sewing all that by hand was a hard and big job. I guess if we want things bad enough we will figure out how to get it. (right) The chair and new cover are beautiful. I think you need to get a sewing machine and learn how to use it just so all of your projects would be easier. Save the pattern of the original chair so if you want to do it again you’ll have something to go by. I mended some jeans by hand when my machine was broke and it was a job. About all I can say is they held together even if it wasn’t the best job. They were for working in the yard so looks didn’t matter. Good advice! I really should take it… Let’s hope I do! LOL!